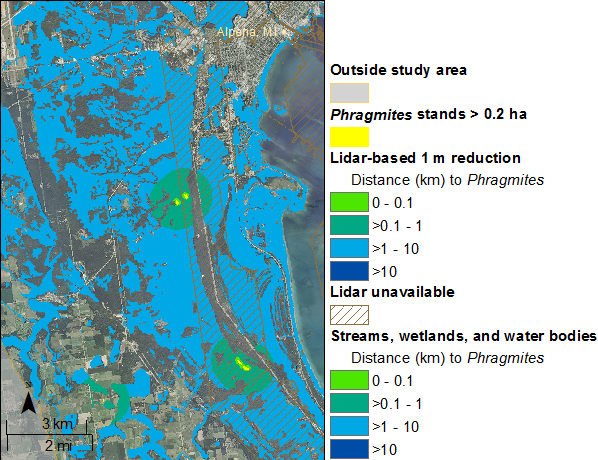 A distribution map of large (> 0.2 ha) stands of existing Phragmites. 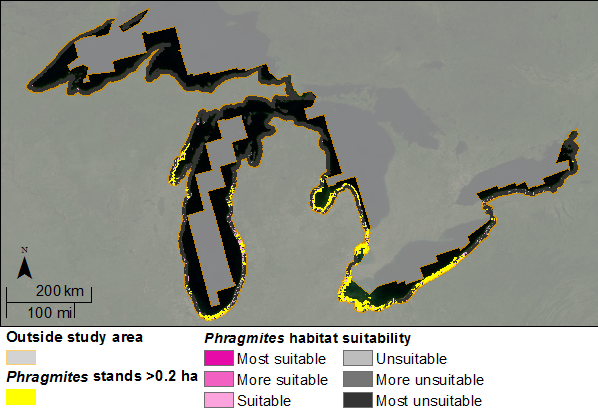 A map of estimated Phragmites habitat suitability based on current environmental conditions. Corridor networks including reduced lake-level scenarios that are weighted by proximity to existing Phragmites to show likely invasion pathways. Please explore the mapper or see our User Guide and FAQ for a depiction of the various features. For content questions, contact Kurt Kowalski. For web or technical questions, contact Lauren Privette. This cooperative research was made possible by the Great Lakes Restoration Initiative. This web application does not support use of Microsoft Internet Explorer. It is not designed or tested for use with IE and functionality may be limited or impaired. Please use this application in a modern, standards-compliant browser, such as Google Chrome, Microsoft Edge, or Mozilla Firefox. SearchingThe search option allows the user to search for a location such as a city, state, zip code, or general place name. Navigating the mapThe scroll wheel on the mouse can be used to zoom, and in the upper left area of the tool are "+" and "-" icons to zoom in and out, respectively. You may also hold shift and drag a box to zoom. On mobile or touch screens, simply pinch the screen to zoom. Home LocationThe crosshair button will zoom the map to your location, and the home button will center the US on the map. Explanation displayThe Explanation box can be collapsed to display more of the mapped area. 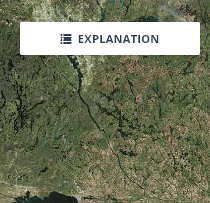 Changing the basemap styleThe "Basemaps" sidebar allows a user to show various geographic information or landscape imagery as a background layer beneath the Map Layers. 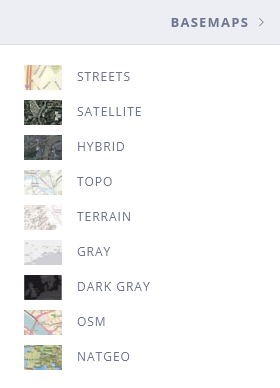 Changing or adding map layersThe "Map Layers" sidebar allows a user to select different contextual layers. 1. What is Phragmites? Why is it a problem? Although there are native Phragmites types endemic to North America, a highly invasive Eurasian subspecies began establishing itself here during the 1800s. The invasive type can grow up to 5 m in height and form impenetrable stands that can quickly degrade large areas of highly productive coastal wetlands and shorelines. Phragmites invasions can hinder access to, and use of, beaches and recreation areas; present a fire hazard; reduce the property value of coastal homes; physically alter the landscape structure; and impact critical natural habitat for fish and wildlife. In the Great Lakes coastal zone, Phragmites has shown that it can rapidly colonize mudflats exposed by low lake levels. Phragmites management is a common objective of private and public land managers. Current management efforts include mowing, burning, and herbicide application, but they are very costly and must be repeated to achieve long-term success (Figure 1). Figure 1. Phragmites regrowth in a coastal marsh after aerial treatment of herbicide (photo courtesy of USGS). Studies have shown that early attention and treatment is critical for long-term success (Carlson et al. 2009). In areas where Phragmites is already well established, complete eradication may be unrealistic, so a coordinated control strategy will help to maximize benefits per unit cost. Funding was provided by the Great Lakes Restoration Initiative (GLRI) for the development of a basin-wide distribution map and decision support tool. The goal of this tool is to help users prioritize restoration efforts, identify areas most at risk to future invasions, and highlight areas where monitoring and rapid response can prevent future expansion. 2. What is the Phragmites? Decision Support Tool (DST), and how do I use it? The DST is a map-based tool that consists of three integrated components: 1) a basin-wide distribution map of current Phragmites populations, 2) a habitat suitability index based on current environmental conditions, and 3) a map of potential invasion pathways defined by corridor networks that are weighted by proximity to existing Phragmites. 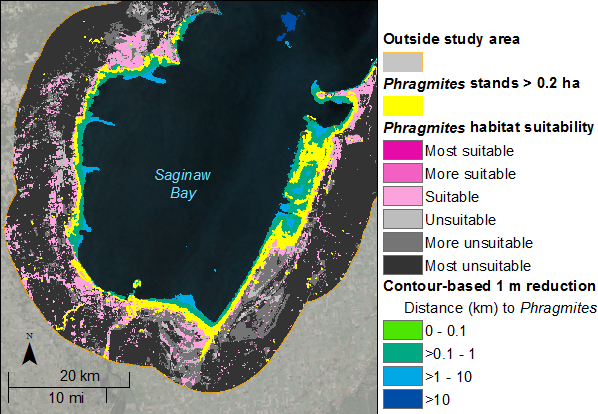 Mapping existing invasive Phragmites utilized remotely sensed imagery and provided the basis for the other two components of the DST (http://www.mtri.org/monitoring_phragmites.html). The habitat suitability index is intended to provide land managers with a general estimation of relative vulnerability to future invasions based on environmental conditions. 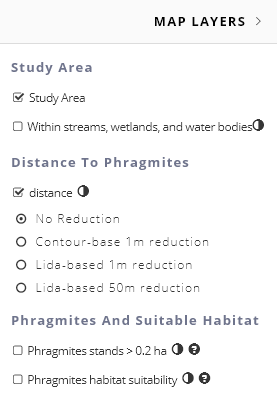 It maps the relative habitat quality of the landscape for Phragmites establishment and is broken down into six different classes: most suitable, more suitable, suitable, unsuitable, more unsuitable, and most unsuitable. It is important to remember that Phragmites is an aggressive invader and can grow in surprising areas, including those classified as "unsuitable" in our maps. The corridor networks consist of inland streams, wetlands, and water bodies as well as offshore corridors that may be exposed during periods of reduced lake levels and are thus vulnerable to Phragmites expansion. The components of the DST are collectively intended to provide users with a robust depiction of vulnerability to future invasions and provide a spatial framework for planning, prioritized monitoring, control, and habitat restoration projects within the U.S. portion of the Great Lakes coastal zone (10 km inland from the shoreline). 3. How can these tools inform different management scenarios? The data contained in the DST represent landscape-scale information that can assist management decisions across the diverse range of conditions found within the Great Lakes basin. Phragmites prevalence varies widely across the basin, so appropriate management strategies for minimizing further invasions and implementing effective restoration projects also vary based on local conditions. At basin- or lake-wide scales, the DST provides managers with a broad view of the range of Phragmites' prevalence and allows the identification of areas with suitable habitat that are not yet colonized (Figure 2). This information can highlight heavily infested areas where patches with high biodiversity are rare, identify regions where control efforts invested now could reduce long-term costs by preventing Phragmites from becoming well established, and guide monitoring and early detection to prevent future encroachment. Figure 2. Distribution of large Phragmites? stands throughout the Great Lakes basin. At finer scales, the habitat suitability index and corridor networks provide insight to different aspects of vulnerability, and may help to guide strategic control and restoration programs. For example, in a heavily infested area, the reduced lake-level corridors identify where expansive shallow areas may become exposed and colonized (Figure 3). Knowledge of these locations could help prioritize intensive control efforts to reduce future expansion or assist with the establishment of restoration projects. Figure 3. Existing stands of Phragmites near Lake Huron's Saginaw Bay. Modeled levels of habitat suitability for Phragmites also are shown. In areas with intermediate densities of Phragmites, stands adjacent to or within large areas of suitable habitat could be preferentially targeted for immediate control efforts to slow expansion (Figure 4). Suitable habitat adjacent to highly valued areas such as wildlife refuges or public beaches could be identified for monitoring and rapid response treatment to prevent the infestation of key features. Figure 4. Northeastern Lake Michigan's coastal zone contains some large Phragmites? stands within and near extensive areas of suitable habitat nearby. In sparsely invaded areas, the locations of existing Phragmites patches in relation to networks of coastal, riparian, and wetland corridors can identify likely expansion pathways and illustrate the need for early treatment (Figure 5). Identifying isolated patches of Phragmites in these areas for treatment and targeting treatment areas adjacent to wetland and riparian corridors could minimize the Phragmites invasion. Figure 5. Small patches of Phragmites? lie within networks of riparian, wetland, and offshore areas in northern Lake Huron. 4. How was the distribution map developed? Cooperative research between the USGS Great Lakes Science Center and Michigan Technical Research Institute (MTRI) led to the development of a distribution map of invasive Phragmites along the U. S. side of the Great Lakes coastal zone (10 km inland from the shoreline). MTRI scientists used satellite-based radar data and an extensive network of field sites to conduct an unsupervised and supervised remote sensing classification exercise and to perform an accuracy assessment of the resulting map. Satellite imagery came from multiple dates throughout the growing seasons of 2008-2010, and a total of 1,145 field sites from 2010 and 2011 were used to train and validate remote sensing classification methods. Mapping efforts identified dense stands that were larger than 0.2 ha (0.5 ac) and erred on the side of inclusion in order to identify as many areas potentially infested by Phragmites as possible (Bourgeau-Chavez el al. 2013). 5. How was habitat suitability estimated? A Geographic Information System (GIS) was used to sample environmental conditions and the newly developed Phragmites map across the study area (Carlson Mazur et al. 2014). Existing GIS data were gathered and processed to produce a set of 87 candidate variables describing environmental conditions. These variables were hypothesized to directly influence Phragmites distribution or to serve as surrogates for processes or conditions that are direct influences based on a conceptual model of Phragmites' biological requirements. The initial set of 87 candidate variables was reduced to 15 for use as predictors of Phragmites occurrence. Statistical models (boosted regression trees) were used to estimate the ecological niche of Phragmites. These models produced a continuous index of habitat suitability which was reclassified to depict six categories of relative quality. 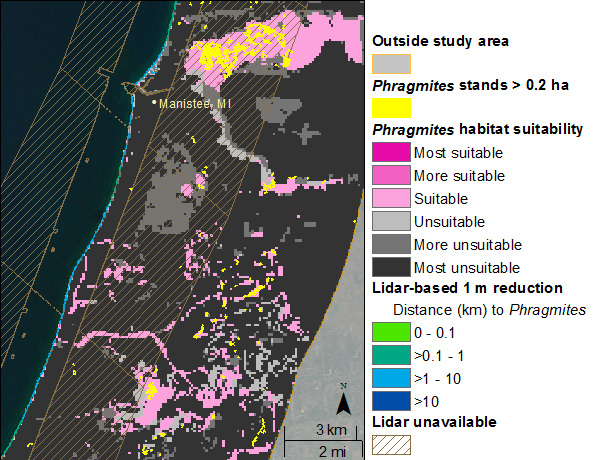 The Phragmites habitat suitability map layer is a dataset published with the paper Assessment of suitable habitat for Phragmites australis (common reed) in the Great Lakes coastal zone, which is available for download. An appendix that provides county-level summaries of current Phragmites extent, both offshore and total area in each county, is also available. 6. What environmental conditions most influence current Phragmites? distribution at a basin-wide scale? Phragmites distribution was tied most closely with topography, proximity to development, soil conditions, and road density. In general, Phragmites in the Great Lakes coastal zone tends to prefer flatter areas that are close to development. Shallow or poorly drained soils and a relatively high road density are also tied closely with Phragmites occurrence (Carlson Mazur et al. 2014). 7. What data were used to construct the vulnerable corridor network? The corridor network has an inland portion made up of streams and rivers, wetlands, and water bodies, and coastal/offshore portions composed of simulated reduced lake-level scenarios. Features that comprise the inland portion came from the National Hydrography Dataset and the National Wetlands Inventory. Lines associated with the inland portion of the network that run through connecting channels and in to the open water of Lake St. Clair are due to the NHD maintaining network connectivity between the lower Great Lakes. Simulated offshore corridors of two reduced lake levels came from two data sources. Where available, recently acquired high resolution LIDAR topo-bathymetric data were used to estimate the areas exposed by 50 cm and 1.0 m lake-level reductions based on mean 2009 conditions. Acquisition of LIDAR-based topo-bathymetry is limited in areas of high turbidity and aquatic vegetation. Therefore, a 1.0 m depth bathymetric contour joined with the shoreline provided a separate estimation of the corridor exposed by a 1.0 m lake-level reduction for three of the Great Lakes (Lake Huron, Lake Erie, and Lake Ontario) and Lake St. Clair. This contour line was used for those areas missing LIDAR data. Offshore and inland corridors were weighted by distance to existing Phragmites. This allows a simple and easily interpretable means for assessing relative vulnerability to future expansion within corridor networks in addition to the habitat suitability index. 8. Are water level fluctuations tied to Phragmites? distribution? Lake levels are dynamic, and the monitoring record has shown that the magnitude, duration, and frequency of low lake levels (i.e., below 2009 mean annual levels) vary from lake to lake. Figure 6 shows the history of lake-level fluctuations with respect to the two magnitudes of reduced lake-level scenarios that we considered for assessing vulnerable offshore coastal corridors. Figure 6. Hydrographs for the Great Lakes and Lake St. Clair show the history of periods of reduced lake levels. Mean 2009 levels were used as a base line for simulating lake-level reductions because the goal of this project was to forecast likely expansion patterns, and 2009 marked the time between which imagery was gathered and ground truthing conducted to establish the current Phragmites extent maps. 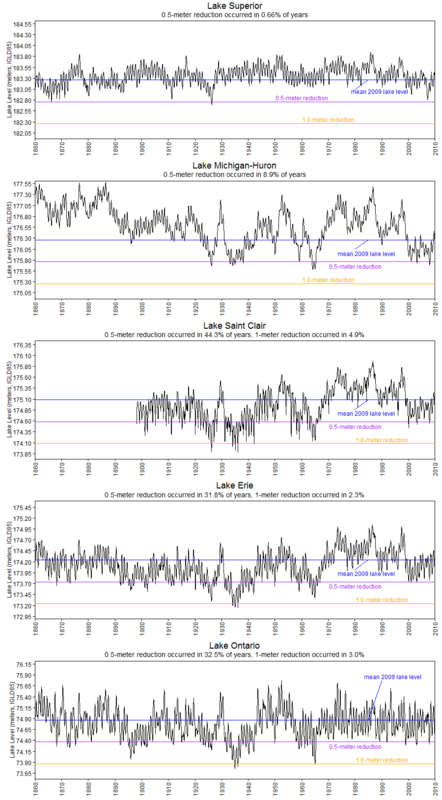 It should be noted that 2009 lake levels in Lakes Huron and Michigan were relatively lower than those in the lower Great Lakes based on long-term records, so fixed lake-level reduction scenarios based on 2009 levels also occurred less frequently in the past for Lakes Huron and Michigan. Lake Superior and Lake Ontario did not experience the degree of low lake levels seen in the other lakes during the 2000-2010 decade, and this may be related to Phragmites' relative scarcity in those lakes. 9. How might climate change impact the coastal corridors? Climate change has the potential to alter the timing and spatial patterns of both temperature and precipitation across the Great Lakes. The onset and duration of the growing season interact with precipitation rates to influence lake levels, and these interactions are complex, contain feedback loops, and are difficult to accurately predict given the uncertainty of future climate conditions. Given these uncertainties, climate change may reduce water levels and increase disturbance through extreme precipitation events and flooding, thereby exposing new areas for Phragmites establishment (Angel et al. 2010). Longer growing seasons and nutrient processing dynamics may give Phragmites additional competitive advantages. 10. What are some limitations of the DST? Mapping identified large (>0.2 ha or 0.5 ac) patches dominated by Phragmites, not small stands or mixed communities that might exist early in an invasion. 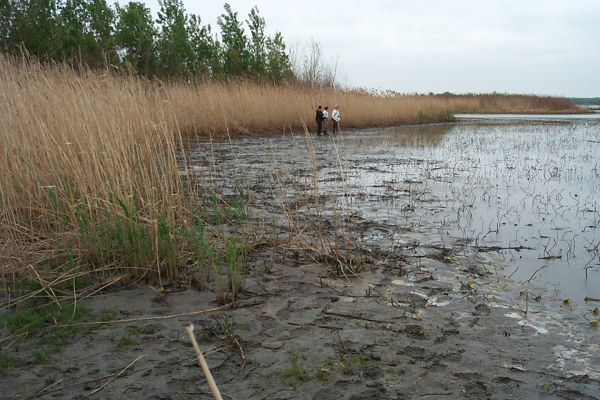 As such, distribution maps do not represent early detection tools in and of themselves, and cannot take the place of monitoring efforts that may be capable of identifying and eradicating invasive Phragmites before it becomes well established. In addition, narrow linear features such as roadside ditches would not be identified in distribution maps, although these may have been present for years and may be important features as propagule sources and dispersion routes. In order to identify as much Phragmites as possible, mapping methods intentionally erred on the side of inclusion, so areas falsely identified as occupied by Phragmites by mapping (errors of commission) are more frequent than areas with Phragmites on the ground that were not identified by mapping (errors of omission). Habitat suitability modeling relies on the controls to distribution posed by environmental conditions rather than the spatial context of a species' introduction history. These models use the realized ecological niche to estimate the potential niche, and this estimation provides one way to assess vulnerability (Coutts et al. 2011, Elith et al. 2010, Anderson et al. 2006). However, the propagule pressure resulting from proximity to well established stands provides an alternative means to assessing vulnerability, and considering both an area's environmental conditions and its position in relation to established stands provides a more robust picture of likely future expansion patterns. Habitat suitability estimates were derived from point-specific samples of data sources with multiple original scales. A 100-m spacing of sample points was used to construct a spatially continuous grid surface that depicts the general relative suitability of an area based on environmental conditions. This methodology does not produce a spatially precise determination of whether Phragmites will or will not be capable of colonizing discrete patches in the absence of control efforts. Offshore coastal corridors were estimated only where data were available to do so. Where it was collected, lidar bathymetry sometimes only covered narrow offshore swaths and not areas with high turbidity or abundant aquatic vegetation such as in Lake St. Clair, western Lake Erie, and Saginaw Bay. The reduced lake-level corridors simulated from lidar in these areas likely extend further offshore than depicted, so care should be used when these corridors directly abut the 'lidar unavailable' layer. The 1-m depth contour used as an alternative means to simulate a reduced lake-level corridor was not available for Lake Superior, Lake Michigan, or northern Lake Huron.